I had recently messaged the DC team telling them of my appreciation of their work. In turn, they asked me to write a little article about my experiences in the Darjeeling District. I am a Canadian, living in Canada. However, I have spent 5 months living in the Echhey Busti on the outskirts of Kalimpong town as a volunteer English teacher. Long are the nights when I dream of ‘alu-thukpa’ and ‘momos,’ the monsoon overhead, and the morning mists blowing in the gentle breeze. Of course! All Nepalis know how great Nepali cooking is, and compared to my frigid home in Northern Canada, the weather in Kalimpong is as close as it gets to perfect. And as compelling as the above listed are, what really made my stay in Echhey not only memorable, but life changing, were the people I met. I was walking down C.K. Chowk towards the Haat Bazaar. Just beside the radio repair place, there was a lady I saw frequently. The day was warm but overcast. The wind was delivering the smell of ‘achaar’ and fresh mangoes to the grinning faces of the market. I had taken it upon myself to speak Nepali as much as I could while I was there, with strangers or friends. People were always happy to help me stumble my way through Nepali. So as I walked by this lady who was selling clothes, we exchanged a quick “Namaste, tapai kasto hunuhunchha?” and I continued along my way. Next thing I know, I hear her calling, “Daju! Daju!”… I had never been honoured by such a title before in Kalimpong so I took a few more steps before, to my surprise, I heard her call yet again, “Daju!” I turned around and there she was asking all about me - where I’m from, what I’m doing in Kalimpong, am I married, and so on. I’ve had that conversation with hundreds of people before, but what really made it stand out for me was the fact that she had called me ‘Daju’. A level of respect I had not been awarded prior to that instance. It made me feel like a Gorkha, like I belonged in Kalimpong. The most rewarding thing I have ever done was learning Nepali, though my knowledge of it has deteriorated since I have returned to Canada. By learning your beautiful language I was able to see and hear the Hill People feel comfortable with me. I went to D.P. Upasak so many times. Mr. Upasak himself gave me a book when I left Kalimpong. Every time I went to the market I stopped by to say, “Namaste”. Even the flower shop across from King Thai knew me well for buying roses for my host family. The taxi drivers on the 13th Mile route knew me too. If I did not go to the market for some days, they began to ask if I was sick! Never had I thought that they would worry this much about the little man from Canada, but it was not the last time the people from the hills surprised me. The Principal of the school I taught at made me feel right at home with his family. Of course, my host family stole the biggest piece of my heart. The more time I spent with them, the Principal, his wife, his daughter and his niece, all under one roof, the more my heart grew. And let’s not forget the student boarding with them, Ang-Su! It is strange having a very similar view of the world around you as the 42-year-old principal of an Indian, ‘busti ko’ elementary school principal, but comforting nonetheless. The more we talked, the more we dreamt. Dreamt of what we can do. Dreamt of what we will do. “No religion says hate the poor people”, he used to tell me. We would talk on his porch about everything - from what we wanted out of life and for our future, to our views on God, until the mosquitoes grew plump and we had to go inside. His earnestness in wanting to help everyone around him was no less inspiring than his humility in being a pillar to his community, home, and school. This man has changed my life in more ways than he would imagine, as I believe he has done for his students in past years. I will never forget his mantra for success: ‘Iman Dhari’, ‘Biswasi’, and ‘Parisrami’. It is the dedication and love of the Indian Gorkhas that have given me hope for the future. It is that love that I find myself giving to others; love that was given to me. For these reasons, for these people, I shall someday return to the hills where my heart resides. Following this we had requested him to kindly share his Kalimpong experiences with us. 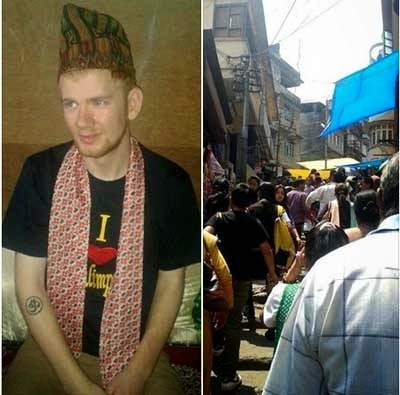 We do look forward to welcoming him back to our beloved hills in the coming days – Tapai jaa nai gaye panee, hamro maya sandhai tapai sangai chha..
Canadian shares experience living in Darjeeling - I am a Canadian, living in Canada. However, I have spent 5 months living in the Echhey Busti on the outskirts of Kalimpong town as a volunteer English teacher.